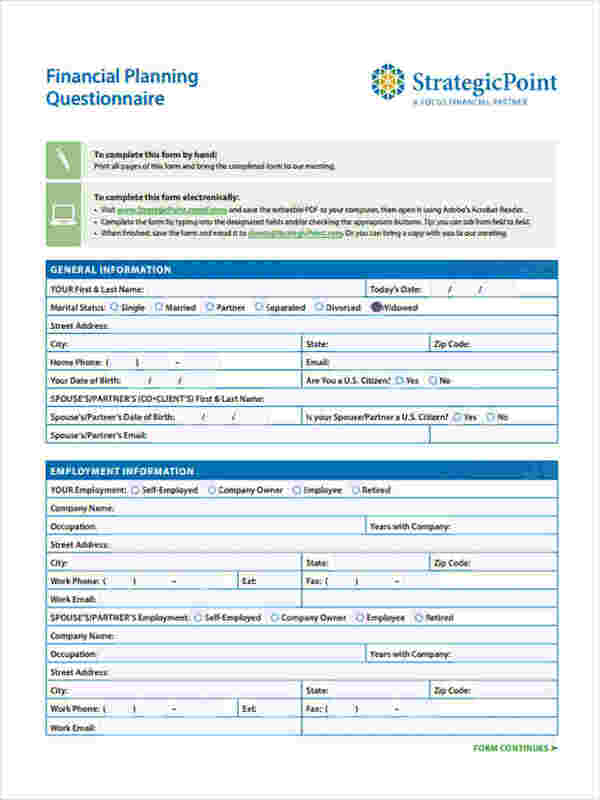 A Questionnaire Form is a document that contains a number of questions and possible answers that serves as choices. Data collection is easier with the help of this form since the information that the surveyor will get from the respondents are specified and standardized in the questionnaire. 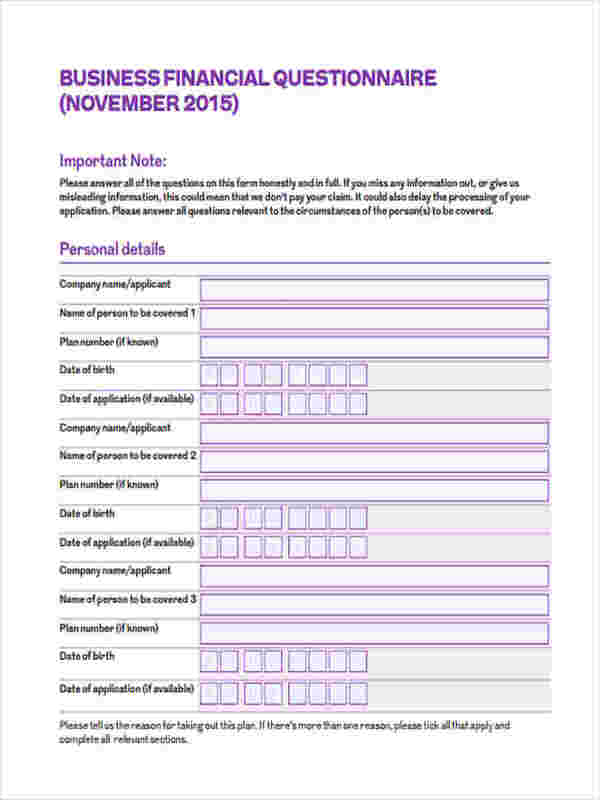 Most legal forms have a section where a questionnaire is integrated, such as in a financial form. The questions will vary on the type of information that the form needs. If the document is for financing, then the questions will be related to a person’s minimum wage, salary and annual income; if it is for a scholarship application, the questions will be about the student’s achievements and grades. What is a Financial Questionnaire? A Financial Questionnaire is a yearly summation of a person’s income, expenses, personal assets and his liabilities. 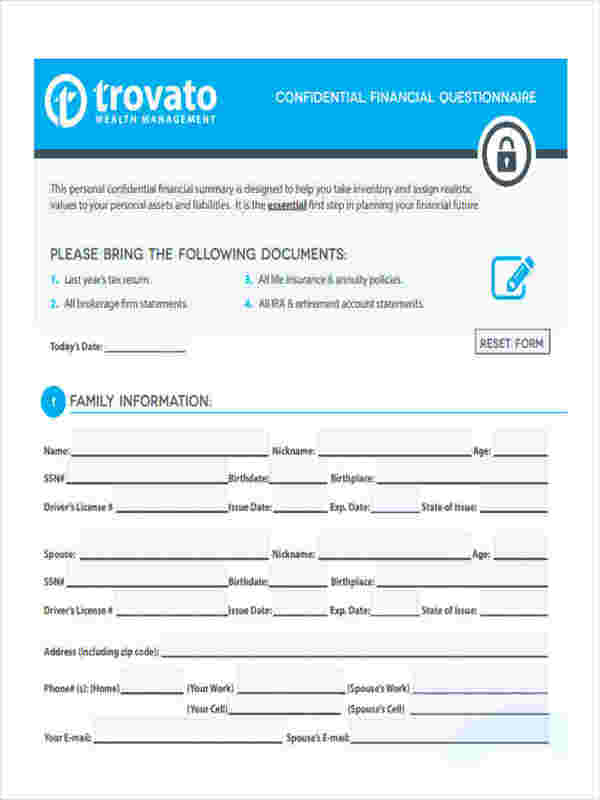 A form that uses a financial questionnaire is a Financial Affidavit Form . These questions can be in a yes/no format and may require a sentence or two in order to specify reasons. Using a questionnaire in a financial form will permit an adequate amount of time for the respondents to answer. Questions about a person’s debts and balances are commonly found in the form. Since the questionnaires will not be enough as a valid representation of the respondent’s information, a respondent must be able to present strong pieces of evidence and proof that he is stating accurate and correct data as answers. To get a better scope of what the particular coverage of a financial questionnaire is, view our Sample Financial Forms and base your own document from our formats. The forms will help in listing down the assets of the organization and track the financial expenditures to gain enough transparency and accountability of the involved individuals. 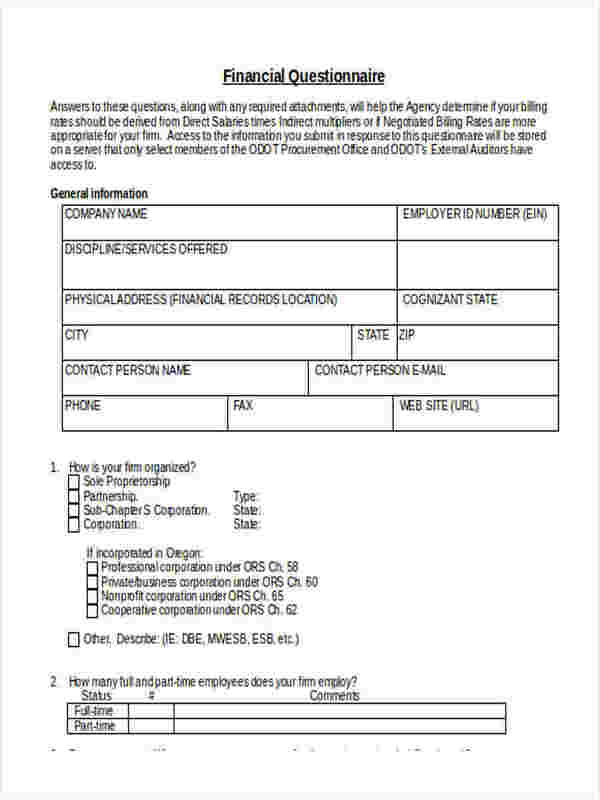 These forms may either be completed online by replacing the placeholders with data or may be printed down to a physical document. 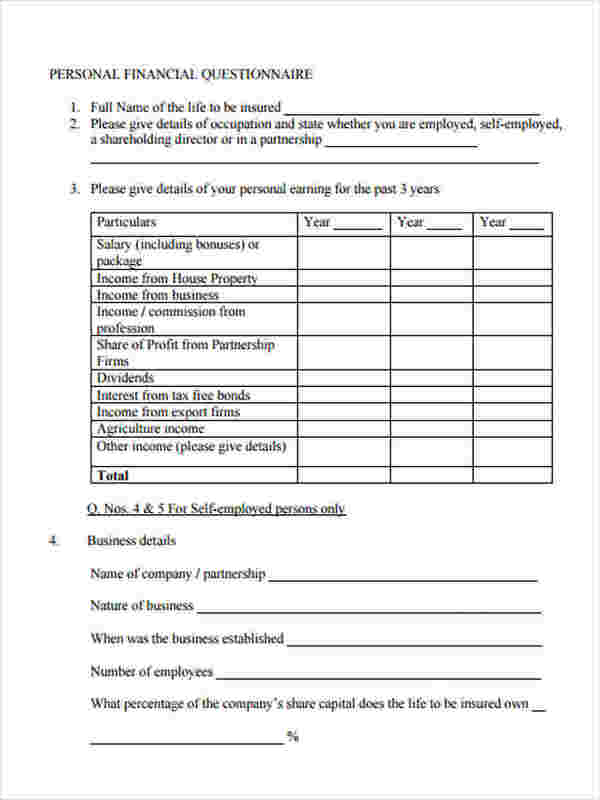 When to Use a Financial Questionnaire Form? Whenever the company will want to know the status of their revenue and their resources. The data will be indicated in a Resource Financial Questionnaire Form. In certain periods of time where a problem is starting to escalate and the company wants their employers to share what they know by using a Confidential Financial Questionnaire Form. When the company aims to know specific information about their employees’ family status and updates. 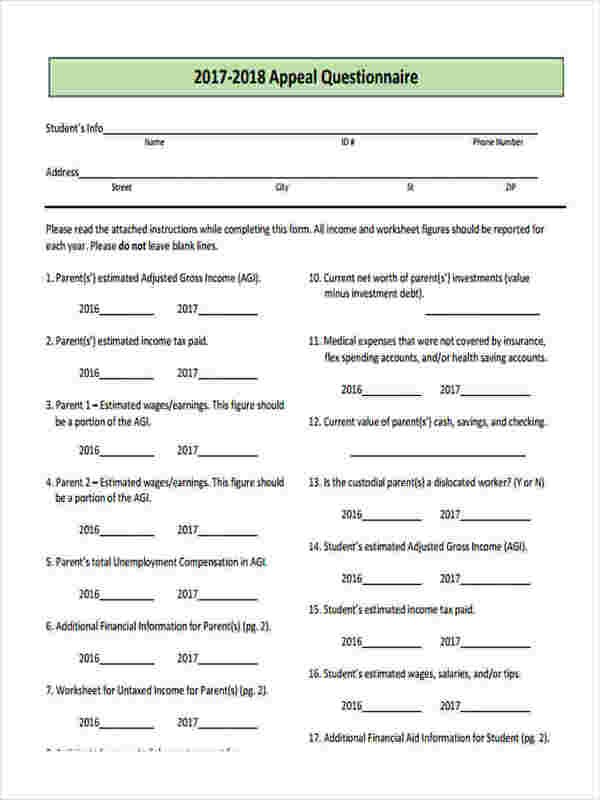 This requires the use of a Family Financial Questionnaire Form. In the event that an individual needs to examine his financial stability; whether he is capable of opening a business in the industry, or if he still needs to save more and spend less from his monthly income. Since a Financial Questionnaire Form deals with questions relating to a company or an individual’s financial status, a Financial Statement Form on the other hand, immediately indicates the answers and all the inquiries that an agency will require annually. 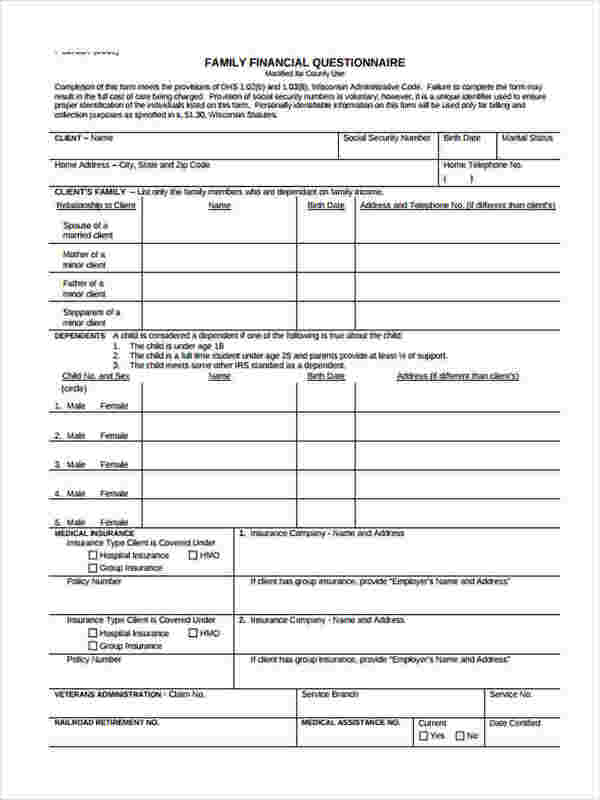 This form may be in different varieties, as it can be used to state a complaint, request assistance, or the rights and obligations of disclosing a client’s information.